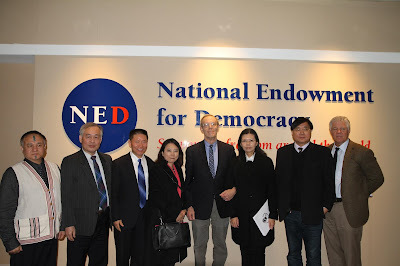 (Washington, D.C.-Feb. 4, 2019) The Hudson Institute and the National Endowment for Democracy (NED) met with a ChinaAid delegation today in Washington, D.C., and heard the plight of persecuted people groups in China, including Li Mingche, a Taiwanese human rights advocate imprisoned in China on subversion charges in 2017. The Hudson Institute, represented by long-time religious freedom proponent and lawyer Nina Shea, questioned ChinaAid on the current state of religious freedom for Christians in China, specifically within the context of new facial recognition cameras, which are being installed in Chinese churches. Shea stated that the intent of the Chinese government is clearly to eradicate Christianity and asked ChinaAid’s president, Bob Fu, if he expected them to succeed. Fu answered that historically, the Chinese church has not been defeated by religious suppression, so he does not think they will be this time, either. When Shea asked him about the current conditions of religious freedom and how it compares to the Cultural Revolution, Fu responded that certain components were actually starting to look like 1930s Germany, when, under the leadership of the Nazis, photos of Hitler were displayed behind pulpits along with the Nazi symbol. Similar tactics are now being employed in some Chinese churches, with Christians being forced to sing the national anthem and patriotic songs, pictures of current Chinese President Xi Jinping and former Chairman Mao Zedong being hung at the front of sanctuaries, and a Chinese Communist Party representative preaching pro-government propaganda after the pastor delivers his sermon. During the meeting, Shea repeatedly expressed concern that China is “looming” as a large modern threat to religious freedom. The next meeting was led by Carl Gershman, the NED’s president, and included several NED representatives as well as religious freedom and human rights experts led by ChinaAid. The NED displayed similar concern over the uptick of religious suppression in China, which ChinaAid has documented in an upcoming Annual Report and expressed a desire to further work to eradicate these abuses. Both meetings heard from Li Chingyu, the wife of Taiwanese citizen Li Mingche, who was taken into Chinese custody after he advocated for Chinese human rights from his home country. Gershman wrote a letter for Li Mingche and expressed his sympathy for Li Chingyu and her husband’s situation. ChinaAid thanks these two organizations for their interest in and support the fight for religious freedom and human rights in China and encourages others in the free world to stand up against the abuses occurring in China.